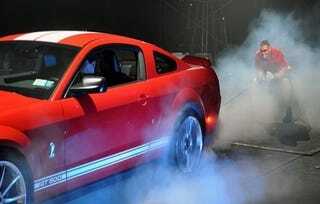 The National Geographic Channel's "Humanly Impossible" is a showcase of freakshows, and Austria's Franz Müllner showed off a pretty impressive feat of strength by holding back a Mustang GT500 as it performed a burnout in his face. As you'll remember, this is the same guy who holds the world record for holding back a Lamborghini Diablo for a full seven seconds. He only held back the GT500 for 6.7 seconds. Is he getting weaker or is the 'Stang just stronger?